Munster (Mumu) contains the present-day counties of Clare, Tipperary, Limerick, Waterford, Kerry, and Cork. 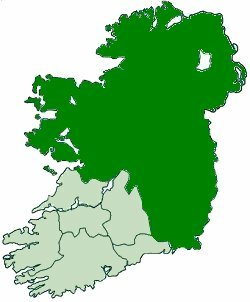 In ancient times, it had no clearly defined capital, perhaps because control of the province was not associated with strong dynastic rules as in Ulster. Munster is the southwest of Ireland and the home Cork, the largest county in Ireland and second largest city in the Republic, Cork City, which is over 800 years old. Some of the legendary persons or groups associated with this province are Fionn mac Cumhal and his Fianna, and King Cormac mac Art (or Aert), an historical figure.